This was more or less assumed once Microsoft killed off Windows Media Center in Windows 10. Microsoft has killed off Windows Media Center as part of Windows 10, but the company is keeping one of its key features for the Xbox One. The games console will get a TV DVR feature in a future update to enable full DVR functionality. You can schedule recordings on the go, and stream games to any Windows 10 PC. Microsoft is even allowing Windows 10 PCs to download shows to play them on the go. Given the rumors, it's not surprising to see this feature be made available, but the extension to Windows 10 will make it a lot more useful. Microsoft announced the new feature on stage at Gamescom today, but the company is limiting it to only free-to-air TV. While the Xbox One can control and view content from cable boxes using a HDMI-in port, Microsoft has released digital TV tuners in Europe and the US to support free-to-air television. Mike Ybarra, head of platform engineering at Xbox, only mentioned recording free-to-air TV on stage, and Microsoft's blog post reveals this is for free-to-air only. Microsoft is planning to enable the Xbox One TV DVR feature in 2016. Do you have to have a Windows 10 PC for DVR features or is an Xbox One alone enough for the DVR features? I'm not exactly clear on that. 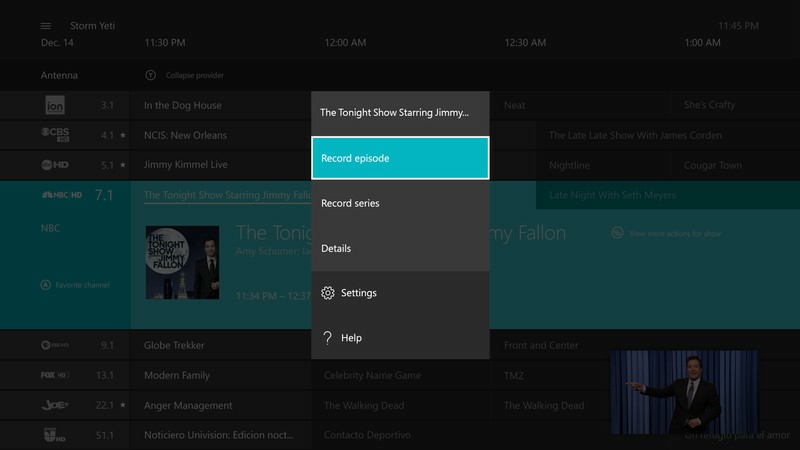 You only need the Xbox One (plus an external hard drive) to use the DVR features. You also can't watch and record at the same time (unless you're watching the same thing you're recording, presumably). You have to have an external hard drive? Why can't you use the internal hard drive that comes with the Xbox One? Every article I have read about it indicates that the internal hard drive is not an option. If I could DVR off my cable with this I would already own it, come on Microsoft!